It’s never too early to start thinking ahead to next football season. So with that said, here are my way too early game by game projections for 2019. Quick breakdown: Miami is approximately where Florida was as a program in 2010. Their most successful head coach in two decades resigned, they just hired a solid defensive coordinator with no head coaching experience to replace him, and their QB position is a complete quagmire. Manny Diaz might make something out of nothing with N’Kosi Perry or Jarren Williams, but it’s hard to believe that will happen in their first game. Prediction: Florida’s got some holes to fill, like on the offensive line, but the Gators have to be the big favorite heading into this one. The rivalry fire will keep the Canes in it for awhile, but Florida picks it up soon enough and rolls. 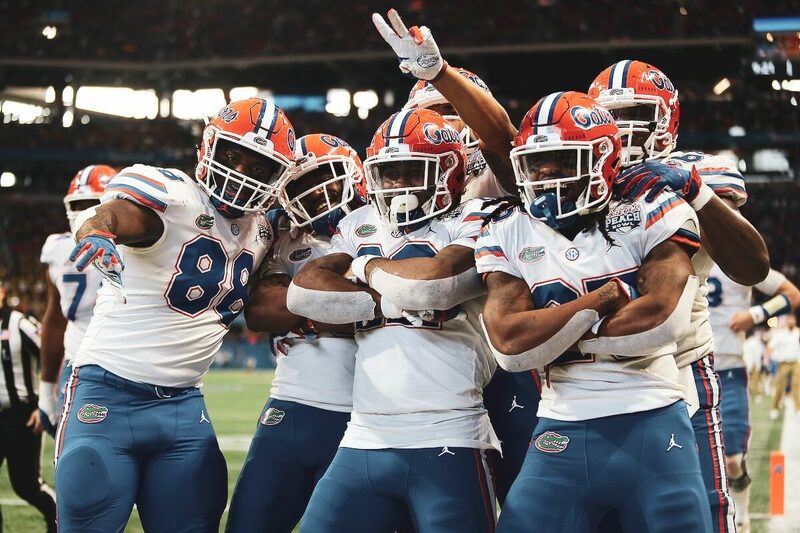 Quick breakdown: It wouldn’t matter how emotionally high or low Florida is after the Miami game, this isn’t a team the Gators are capable of losing to. The Skyhawks stumbled to a woeful 2-9 record in the FCS’s Ohio Valley Conference In 2018 and have a laundry list of additional questions to answer in 2019. Prediction: Pick a number over 40, pick a number below 15, and you’re as likely to nail the final score of this one as anybody. With a Kentucky team that beat Florida in Gainesville last year next on the docket, I’ll go low here on purpose with the idea that Mullen opts to give his backups plenty of playing time and not tip his hand too much. Quick breakdown: Kentucky had to beat Florida eventually, but even with how solid the Wildcats turned out to be last year, that they did it in the Swamp against a ten win Gator team that won a New Year’s Six Bowl will remain hard to believe. But this Cats team will be a shell of that one. Quarterback Terry Wilson is back, as is Lynn Bowden, but terrorizing tailback Benny Snell, three key receivers and two starters on the offensive line are gone. Kentucky should be still good in 2019, at least by their standards, but how well they fill their many gaping holes will determine how good. Prediction: Dan Mullen is perfect in true road games since re-joining Florida, and Kentucky’s Kroger Field is likely the least intimidating road environment in the SEC not including Vandy. He’ll have his team ready to go this time, and it will show. Quick breakdown: somehow, this mess of a program managed to beat both Kentucky and Auburn last season, but that shouldn’t take away from just how lowly this program currently is. Jeremy Pruitt has made some strides, but the program he took over was in such bad shape that it’s still worse off now than Florida was when Mullen took over. He’ll get some key pieces back, not the least of which are QB Jarrett Guarantano and leading rusher Ty Chandler, but the Vols have been so bad with all those returning pieces in the past that it’s fair to wonder if that’s a good thing or a bad thing. Prediction: Tennessee won’t be the train wreck of a program it was the last two years, but they’re at least two or three years away from being able to win a game like this. Florida cruises in the Swamp. Quick breakdown: As far as FCS teams go, Towson’s actually decent. But there’s a reason that not a single player on the Towson roster had an offer from Florida out of high school. This is the Gators’ second FCS payday game in September, which hasn’t happened since 1988, and Florida will intend to make the most of it. Prediction: same story as UT-Martin: pick a big number, pick a little number, and let’s move on to the fun part of the schedule. Quick breakdown: For as highly touted as Jarrett Stidham was, he just wasn’t the right fit for the kind of offense Gus Malzahn runs. Now he’s off to the NFL and Malzahn is off to search for a more naturally mobile replacement. Auburn could easily be 2-3 coming into this game, though, and that’s before games against LSU and Alabama. But regardless of the record Auburn enters the Swamp with, this team is loaded with talent on both sides of the ball with most key contributors from 2018 returning, including running back Kam Johnson and receiver Eli Stove. Prediction: Auburn has created a nasty history of winning games against Florida the betting world says it shouldn’t, most recently sweeping Urban Meyer in 2006 and 2007 seasons. With this Gator team on the rise but still not immune to losing such games, Auburn will get the better of Florida once again with an upset in the Swamp. Quick breakdown: It seems as though every year, there’s talk of Ed Orgeron being on the hot seat. But after a unanimous top ten finish and a Fiesta Bowl win, that talk may finally quiet down and be replaced with frightened whispers of what he’s building in Baton Rouge. If Joe Burrow can continue to raise his game, LSU could be quite dangerous on offense in 2019, as he has tons of returning receivers to choose from. And as usual, LSU’s defense should be brutal. Prediction: Death Valley is not the place you want to go to feeling sorry for yourself, which very well could happen to Florida after my projected home loss to Auburn. On paper, the two teams appear about even in 2019, but LSU will be too much to handle on the road. Quick breakdown: All signs indicate that Will Muschamp has taken South Carolina as far as he ever will. Jake Bentley is back, and so is Rico Dowdle, but the Gamecocks lose a ton of production on both sides of the ball and Muschamp isn’t likely to have fun trying to replace it. This game is in Columbia, but when you’re outmatched by as much as Cocky appears to be, that only helps so much. Prediction: It’s entirely within the realm of possibility that Muschamp will go 4-8 once again in 2019, and if his team appears to be on that trajectory when these teams meet, expect a last stand sort of performance at home. But as it did a year ago in the Swamp, Florida will break a two game skid with a wild comeback victory over the Gamecocks. Quick breakdown: Jake Fromm enters his third year as the starter, but this time he has a lot of uncertainties around him. Gone are receivers Riley Ridley and Mecole Hardman and tight end Isaac Nauta, but if nothing else, Georgia has a solid running game to lean on with D’Andre Swift and Brian Herrien back, plus Zamir White returning from an ACL injury. Likewise, the defense loses a few key pieces, but Kirby Smart has recruited well enough to expect minimal drop off there. Prediction: Georgia may take a step back in 2019, but they aren’t going to step down from their place atop the SEC East; somebody else will have to make the effort to kick them out of it. Florida appears to be the most likely candidate to do so, and thus they’ll give Georgia a battle. But the Dawgs’ running game will be too much to overcome. Quick breakdown: Vandy’s going to have to find a quarterback to replace Kyle Shurmur, but they could be poised for a six win season if they do. Running back Ke’Shawn Vaughn, wide receiver Kalija Lipscomb and tight end Jared Pinckney are all back, and so this offense could be legit. But the defense has too many holes to replace for the Commodores to aim any higher than bowl eligibility. Prediction: the Commodores have this venomous sort of effect against the Gators, and after what I project to be a deflating loss to Georgia, that effect could be exacerbated. But as usual, Florida will grind this one out and win it on an Evan McPherson field goal. Quick breakdown: Kelly Bryant takes over for Drew Lock, but it’s going to be harder to fully match what Lock did than many realize. Most of last year’s skill position players are back, so that should help tremendously. The concern in CoMo is the defense. Barry Odom has a host of talented voids to fill (the biggest of which was vacated by former five star DT Terry Beckner) and that could ultimately be the Tigers’ downfall in their quest back to Atlanta. Prediction: Missouri seems to have an even more venomous effect on the Gators than Vanderbilt, as evidenced by 36-17, 42-13, 45-16 and 38-17 maulings of the Gators in the past six years. But road crowds seem to fuel this team. Florida pulls off the mild upset in the Ozarks. Quick breakdown: The answer to the question of, “Who will start for FSU at QB?” likely won’t come for another six months at least, but whoever it is- James Blackman or Deondre Francois- has a year of starting experience and a head to head win over Florida under his belt. To boot, the always dangerous Cam Akers is back, and the defense should be a little better in 2019. But for the Seminoles, the fate of the entire program hinges on the offensive line. The Noles require improvement of monstrous proportions up front; failure to get it could very well result in another five win season. Prediction: it may not be possible for Florida to face a collection of players that wear the garnet and gold of FSU than the group they faced last year. But this Gator program is still well ahead of where the Seminoles are, and it’s too great a difference to be made up in one year. No way we lose to Auburn in the Swamp. I agree with your other predictions. Although we have a bigger shot of upsetting Georgia then you give us! If our O- Line is solid by the that time (9th game) and Zuniga/ Moon/ Chatfield trio can pick up the edge rushing and we don’t have a huge drop off from 2018 we will be fine! Let me get this right you pick Auburn to beat us dont think so they lost to Tenn of all teams this year and we keep it close with Ga all the way up to the 4th quarter dont see them puppies beating us this year again they lost to many coaches. Maybe and thats a big maybe we lose to LSWho. Out of our schedule i see us losing maybe 1 game pick your poison. UF has improved under Dan Mullen but this will not be a blowout game for either side. Both need major work on the offensive side, however I believe Miami’s Defense will be enough to hold UF off. Let’s not forget they lead the nation in sacks and was #4 in total defense, UM has owned this series and will continue to do so.